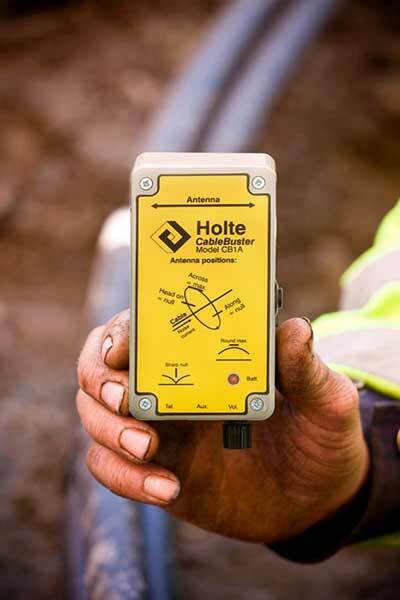 Holte Electronics AS offers simple, affordable cable locating tools for excavator drivers. CB DiffAnt is not disturbed by signals of remote origin (radio signals) and can operate with or without its companion transmitter CableAnimator. 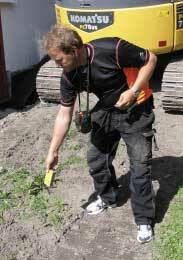 CB DiffAnt is the perfect cable locator for excavator drivers! CB DiffAnt (CableBuster with Differential Antenna) localizes buried cables by means of random noise and secondary emission of radio signals in the lower long wave range. Its differential antenna it is insensitive to airborne radio signals, but receive them indirectly via the cables. Cables, including buried ones, function as antennas that pick up and re-radiate radio signals. Hence we have succeeded in turning a problem into an advantage! In this short video you can see (and hear) a CB DiffAnt prototype in action in Germany filmed by early adapter Michael Wohlfahrt. CB DiffAnt is slim and easy (only 400g), though robust enough for rough use. It has no adjustments except for a volume control and no visual display. You hear the detected noise modulated with a tone pitch that indicates the signal strength in ear phones - just as precise, but much faster and gives more information than a visual display or a beeper. In most cases you don't need a transmitter. The "natural" magnetic noise from the cables is usually sufficient to localize them. In case of too weak signals, or if you wish to mark a cable or a net with your own signal, you may use the transmitter CableAnimator. It started in 2009 with the little CableBuster ("electronic divining rod"). It works well in Norway and the most part of Sweden, but turned out to be disturbed by long wave transmitters in Germany and adjacent areas. In order to overcome this problem CB DiffAnt was introduced. It has a differential antenna (hence the name DiffAnt) that is insensitive to air borne radio signals, but picks them up indirectly as secondary emission from nearby cables (cables act as antennas) and exploits them to localise the cables. Thereby we have succeeded in turning a problem into an advantage. CableAnimator placed at cable drawdown. The signal was and clear in all power cables in the neighbourhood. 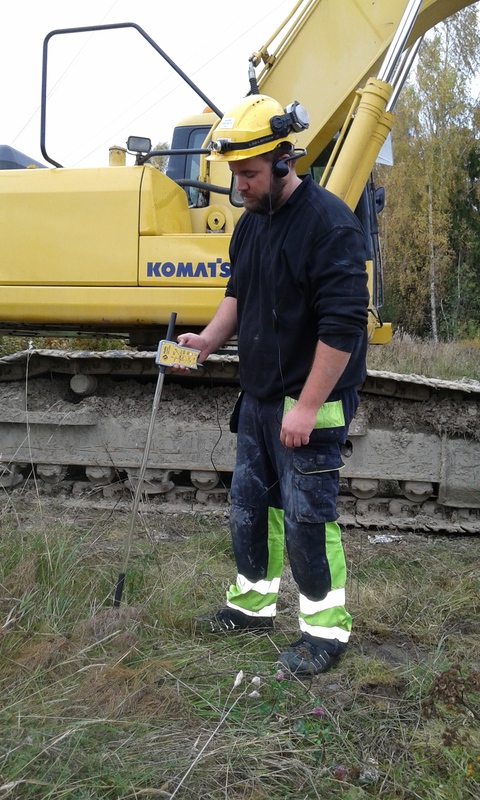 Veteran user Staale Ludvigsen finding cables with the little CableBuster, the ancestor of CB DiffAnt. He is using CableBuster since 2009 and says it has saved him a lot of money and trouble. In case you are intersted in an agency, please let us know.